Bronze is an alloy of copper and tin. Brass is an alloy of copper and zinc. 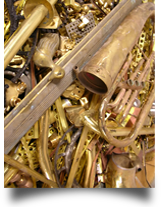 We are scrap metal brokers with experience in the purchase and sale of legally salvaged bronze and brass scrap materials. We work with manufacturers and scrap dealers who have their Secondary Metals Recycler Licenses to sell scrap brass and bronze to buyers across Florida and the United States. Give us a call to find out today’s prices for bronze or brass scrap of all grades. Prices vary greatly based on the grade and quality of the material, as well as market conditions including worldwide supply and demand. The brokers at Valley Metal Services have extensive knowledge of the market for scrap brasses and bronzes. We have built relationships with scrap metal buyers all over the country, including foundries, mills and manufacturers. These relationships help us market brass and bronze scrap so we offer our sellers the most competitive prices. Brass is often used in the making of bushings and bearings, plumbing parts, pipes and tubing, bullet casings and rifle shells, condenser tubes, keys, door handles, and light fixtures. Scrap Red Brass can come from plumbing parts and the bushings and bearings from cars and other types of machinery automobile parts, projects. Red brass will fetch a higher price than scrap brass that is contaminated with lead, steel, and other materials. Yellow Brass scrap consists of mixed yellow brass solids, brass castings, rolled brass, rod brass, tubing and plated brass and other types. Refinery Brass contains a minimum of 61.3% copper and maximum 5% iron and to consist of brass and bronze solids and turnings, and alloyed and contaminated copper scrap. Brass and bronze are non-ferrous metals, which means that scrap materials made of these alloys can be recycled repeatedly. Bronze is a dense and heavy type of metal that is often used to make decorative signs and markers. The highest grade of scrap bronze contains low levels of lead. High lead bronze scrap that contains solids and borings is a lower grade. Manganese bronze is a copper alloy that is strong and durable. Manganese bronze can be recycled to manufacture industrial parts including load bearings, gears, cams and hydraulic cylinders as well as marine propellers. Manganese bronze and nickel aluminum bronze are both used to manufacture ship propellers. Brass or bronze fire department connection (FDC) valves or fittings. Sellers of any these and other types of regulated brass and bronze scrap metals will be required to provide a receipt or bill of sale that proves they are the owner or legally authorized to sell the material, and follow all other rules and regulations not listed here.